How to choose SD memory card? SD memory cards have become part of daily life for all computer users. Even though they appear to be a simple storage device, there are few things you need to know before you choose a memory card. Learn how to choose the best memory card for your camera, smartphone or other electronic devices. Secure Digital (SD) Memory cards are small storage devices to store data in digital form. They are small in size, can hold a large volume of data and are easy to handle. Now-a-days, many electronic devices and gadgets including cameras, video players, cell phones, video game devices, tablet computers, along with a wide range of other electronic devices has in-built support for Flash memory cards. The storage capacity of flash memory cards range from 256MB to 2TB. Storage capacity is always going higher and higher and in the near future you could see memory cards that can store several terabytes of data. As of now, the standard SDXC card can support up to 2TB. There are several other flash memory cards including CompactFlash, Memory Stick, USB Flash drive, PC Card etc. SDHC format was introduced to support larger storage capacity and this format supports up to 32GB. However, eventually the 32 GB was not sufficient in modern smart devices and so a new format called SDXC was introduced which support up to 2TB. Newer formats are backward compatibles, which means, a host device which support a newer type will support the other types as well. The above memory card types have become industry standards for external storage in small devices and most devices that require small external storage accept one of the above flash cards, depending on the size of the card slot/tray. The physical size (form factor) of the card does not directly affect the storage capacity. Remember the SD, miniSD and microSD cards are not compatible in terms of read, write and storage mechanisms. However, depending on the card reader slot, different sizes may not be compatible with your device. Usually, most small devices will be compatible with only one of the memory card types and will not have sufficient options or slots to insert more than one card type. However, larger devices like laptops, desktop computers, tablet PC etc may have multiple slots that accept multiple types of flash cards. If your computer does not have a flash memory card slot but you want to store or retrieve data with a flash memory card, you can always buy and use an external flash memory card reader. You can insert the flash memory card in to the card reader and then connect the card reader to the computer through the USB drive. There are couple of factors to consider before you choose an SD memory card for your camera or other devices. SD Memory Card size is the most important factor to consider when you choose a memory card. Most devices support only one of the sizes (SD, miniSD or microSD). Find out what is the card slot size and then pick the supported size. If you are not familiar with different sizes, you may not be able to figure out the size just by looking at the physical appearance of the slot. Instead, look at the specification of the device. It would have written SD, miniSD or microSD as compatible memory card type. If you have a smaller card than the supported card size of your device, you can buy a card adapter. You can buy SD card adapter that can hold both miniSD and microSD cards. Buy the card adapter that fits in to the size of the slot in your device. Insert the small memory card in to the adapter and then insert the adapter in to the slot/tray in the device. 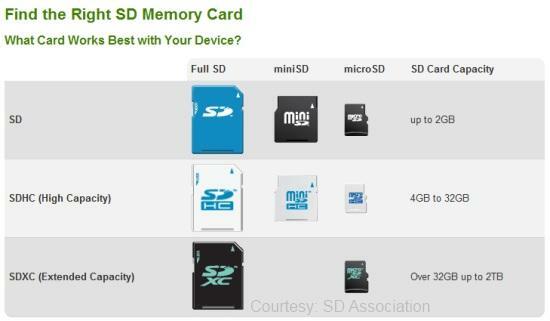 Since SD, miniSD and microSD format are compatible, you should be able to use it in your device. You can buy memory cards at different prices, varying from $1 to $100. Have you ever thought why the prizes are so different? An important factor that determine the price is the writing speed. If you are using it in a device just for storing data and speed does not matter, you can choose any writing speed. However, if you are using devices that require high speed writing, like Digital SLR camera, speed is of at most importance. If you want to take several high quality pictures as quick as possible, your memory card should support high writing speed. Also, to record HD video at the speed it is shooting, you need high speed memory cards. For hi speed recording and writing, choose the memory cards with class 10 or higher. Price can vary significantly based on the writing speed. Choose a card with the write storage capacity. If you are recording videos or large number of high quality photos, then you might need 16GB or higher storage capacity. The price does not vary a lot depending on the storage capacity, so choose a higher size if possible within your price range. I personally buy 32GB memory cards for all of my devices including DSLR camera and smart phones even though I never reached the maximum capacity in regular use. Hi-Tech Solutions has come up with yet another innovative low cost gadget- the e-Touch Pen, using which you can convert your normal screen into a touch screen. Learn about the e-Touch Pen, its features and how to use it to convert your normal PC screen to a touch screen. I would like to thank you for sharing these wonderful tips. It will definitely help people who are looking forward to buy SD cards. One of the best things to buy them at low prices would be to buy them online on eCommerce sites like Flipkart, Amazon, Snapdeal etc. You can get nice deals on them and are available at very low prices. If you use cashback sites while making the purchase, you can also save a few extra rupees.